Wartburg Water to Thrive 2017-2018 – Well 13 & 14, Funding Complete! Wartburg College Water to Thrive is an entirely student-led campus organization at Wartburg College in Waverly, Iowa. Ed Scharlau, a founding member of the original Water to Thrive organization and Wartburg alumnus, instilled the idea of a student organization at Wartburg after having much success in the 2011-2012 Wartburg Wells campaign headed by two Wartburg students. Over $30,000 was raised including the $10,000 Davis Peace Project grant, which the students were rightfully awarded. With such a great response from fellow students and the Waverly community, Scharlau and company believed that the future of Water to Thrive at Wartburg was bright. In the fall of 2013 two students, Meghan Parman and Liz Shull learned about Water to Thrive and the desperate need for clean water in rural Africa. With the help of Scharlau and their on-campus advisor Gail Sexton, the two decided to take on the challenge of starting their very own student organization Wartburg College Water to Thrive. 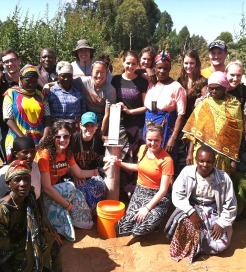 Wartburg College Water to Thrive is devoted to raising awareness and bringing safe, clean water to rural Africa. As a group of young passionate students, it is their goal to make a difference by sharing the real-life struggles faced daily by thousands of people throughout Africa with their fellow peers. Wartburg College Water to Thrive strives to not only impact the lives of Africans in need of safe, clean water, but also the Wartburg students who choose to join the exciting journey. In May 2014 and 2015 two groups of students were sent to Tanzania to participate in topping off new wells. By working with other on-campus organizations, holding independent fundraisers, and seeking out support from the generous Waverly community. After a successful 2015-2016 school year Wartburg Wartburg College Water to Thrive raised just over $10,000 to build two wells in rural Africa. This year with even bigger goals than last year, we aim to fund three wells. With the addition of new members and the return of old members, Waterburg College Water to Thrive is excited to see what this year holds in store for us. Wartburg College Water to Thrive is eager to continue to fund many wells to come.